The sun rose today at 0854 and will set at 1555 (0355pm) - the length of the day will be 7 hours and one minute!! The sun peeked from behind the trees into my studio for a short while and I had to adjust my seating. The temperature is back to -30°C but we had one "warm" day in between. That day was yesterday and instead of very cold air we got a huge dumping of new snow; the snow in the air was as thick as pea soup. I had to make a trip to the town and the driving conditions were truly very poor. 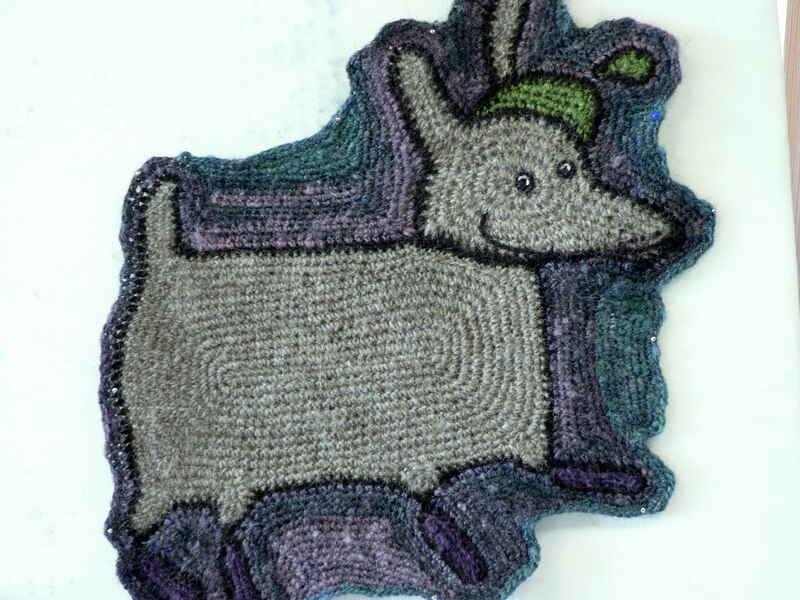 this dog is very curvy; the moment I take off the pins, it goes all wild. I think I have to rip the background from between the hat and the tail, I think the problem is there. I had in mind making these into a larger piece but could not make a decision about the background color or the yarn and so half-mindedly picked up one (badly) spun ball of singles and started to crochet with it. I like the color and its variations in the yarn, but I don't have lots of it, so I have to make these dogs into something fairly small. The two fellows are not enough and I am thinking of crocheting a third one. The thought made me pick up the drawing materials and I have worked on a picture of a dog and three birds. I am not sure if this picture will result into anything worth showing to you, so this might be the first and the last time you see this, but it is a good one to show you my steps in picture making. and in the end will add black ink with Pigma Micron waterproof pens. I have been practicing with nib pens and I do love the natural line, but I am so used to my old ways that I keep returning to Micron pens. The couple of reindeer, I talked about last time, were joined by a third one and they are all doing fine. They roam around the neighborhood at the moment and I keep seeing them every now and then from different windows of the house. I tried to take a picture the day before yesterday, but there were so many trees and piles of snow in between that I could not get good pictures. If they come closer, I will try again. Good morning from my part of the world. While you are having cold air, we are having unusually warm weather here in Georgia (a strange February for sure). 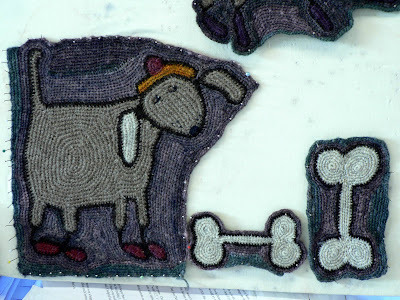 The crocheted dogs/bones are very cute--I can't imagine how to make them--my crochet skills are very limited. 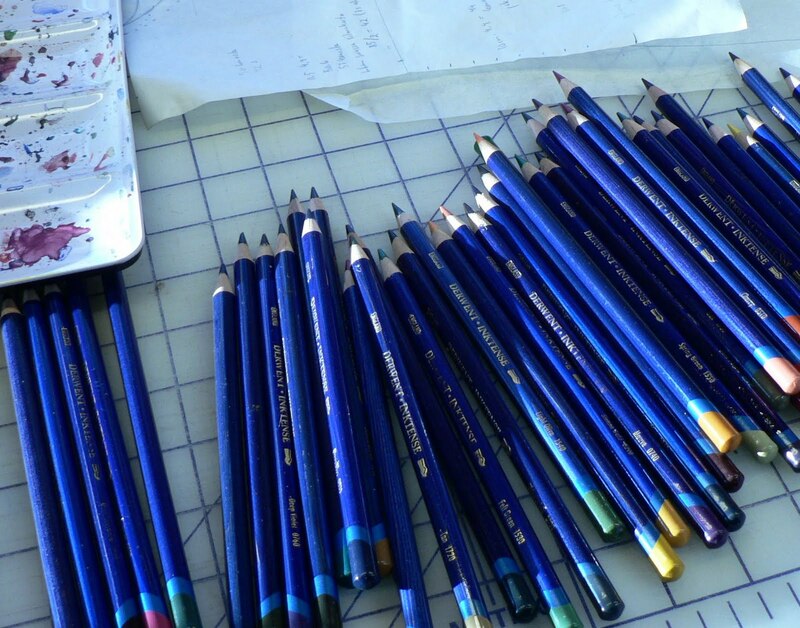 I love your drawings, like most everyone who reads your blog. If you make the notecards available, I definitely will purchase! Agreed with the last commenter; if you make th notecards available; I will stand in line! Love the freefrom dogs! Very inspiring. Ditto the first two comments. I love your drawings. But I also understand that having to ship around the world could be cost prohibitive. I'm always on the lookout for a new calendar! I, too will buy your prints of your drawings immediately (just like I do your patterns). I just finished your latest baby bonnet - wonderful pattern, just the right amount of challenge with a beautiful result. Keep up the great work! You have so many wonderful talents, I love the things that you create. I think your drawings would make the sweetest notecards or even little gift cards to go with handknit presents. I love reading your blog, seeing what new projects you are working on. I'm so glad I found you! lovely dogs and sweet cowl:)) i like your drawings as much as knitted things. your dogs are really cute... good luck with fixing the "going-wild-problem"..! i myself belong to the category paper lover and would definitely love seeing your work available on cards!! 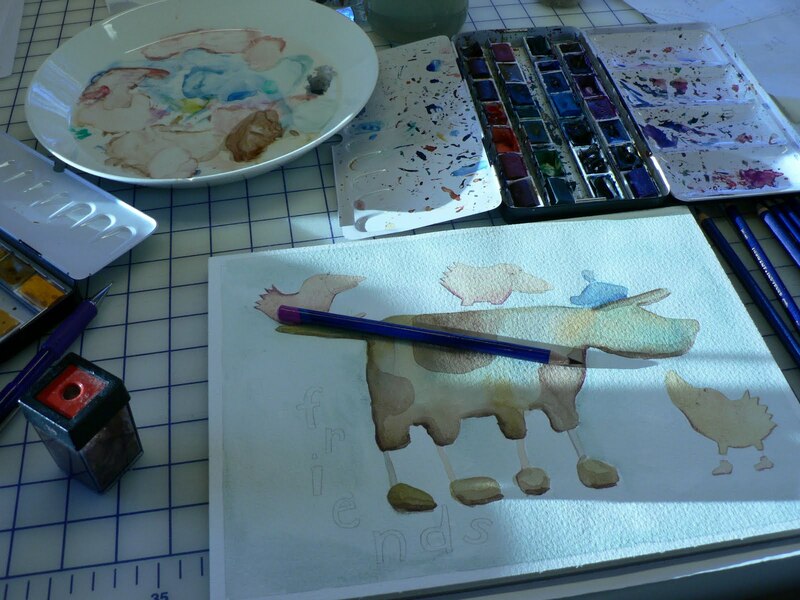 that watercolor dog looks sweet! I enjoy your blog so much. You are so talented and interesting. I would LOVE to buy notecards with your lovely drawings on them. Please consider making them. Again--thanks for sharing your talent and stories from your corner of the world. I live in Ohio, USA. I love love love the dogs! I wanted to say Thank You for introducing me to Carla Sonheim. I bought the book and it is exactly what I have been looking for. Stay warm. Hello from snowy Colorado, USA. I so enjoy your blog, and particularly love your freeform crochet dogs. I don't know if the size of them would be conducive - but they would make such fun pillows - and being stretched over a pillow form may help with the curling issue on the one dog? Your illustrations are so fun and lively. I hope you do make some notecards! I have been a "lurker" for a while, but today I was finally prompted to comment. I love your ways of expressing yourself. They are so different from what I do, even though I knit too. I guess your works seem more like art, whereas I am more of a crafter. And that is okay with me! I hope whatever you do in the future continues to make you happy. I think that is the key to life, doing what you enjoy. Hello from Ottawa, Canada, where it is balmy today, at only -7C. It would be lovely to see notecards from you! Your art is different from anything else I've seen, and always makes me smile. Your knitting and crochet is truly inspirational! I see the line for your note cards is growing, and I will definitely have a place in it. I love your drawings! I love your art even in freeform crochet. Just amazing what you can come up with. You are so talented, Lene. Whether it is the high quality of your knitting, your crocheting, your artwork, or your master crafting of words....your world is so interesting. Your warmth and creativity warm the chilly days and make the sunlight grow in all our hearts. Your blog is a wonderful asset to the troubles of our world. Thanks. Since we are connected through Ravelry I have followed your blog for a little while. What a wonderful blog and behind it a lady with all sorts of talents. Thank you for sharing! Love the dogs......and would be interested in some cards too. I'd love to see how you draw Whippets! Thanks for the update on the Reindeer....and looking forward to the photo when you snap it. How is the book coming along? I am anxiously awaiting it. I'm so sorry it is so cold there. I'm here in Texas in the United States and it has been warm warm warm. Except for this week we really have not had a winter at all. I'm planting tomatoes now! We've had the air conditioner on a good part of January! I wish I could send you some of my warm air and you send cold air back to us. I guess this is what we have to expect with climate change. Love your drawings Lene! And your crocheted pictures too...they remind me of patches to appliqué on a garment. Very fun. I have been following your blog for quite a few years and have always enjoyed it. Your drawings are something I look forward to seeing. They feel light and playful to me, a nice addition to any day. I also looked up Carla Sonheim and purchased her book. I like her approach to creating and have been playing my way through her labs. Thanks so much for sharing what you do it has certainly made my life richer. I love your drawings so much, Lene! So happy to see them again. Plus, I learned some Finnish words from them. Yes! Freeform is great fun to make! I think I'm at the back of a very long queue of people who would like you to make notecards or prints. Your drawings are so lovely.